With so many summer festivals and attractions for a family to take in, commuting by bike can add to the fun. Especially if the event is within three to seven miles of your home or the lodge you are staying at. By leaving the car behind and traveling by bike everyone in your group can spend more time having fun with less of the hassle factor of driving and finding parking at the event. 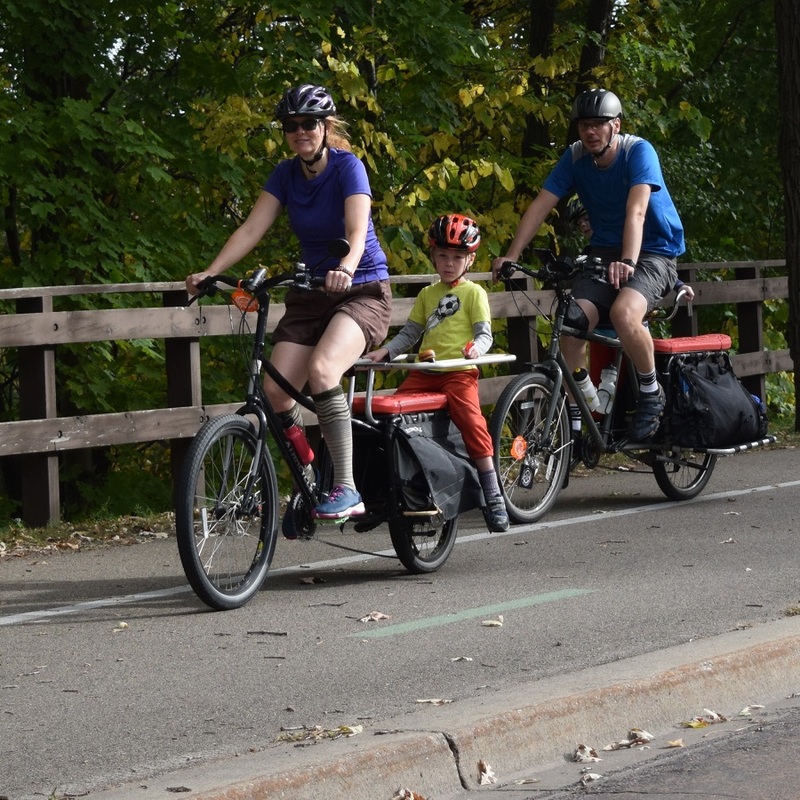 This bike photo shows a family riding a trail next to a busy road that will take them to a local community celebration. If you are not familiar with the area you plan to ride, look at city and county maps. Most are available online and Google Maps is a good backup option. Most cities offer maps available at the tourism center, library or city office which show both the streets and trails in an area. When planning a route is a lot easier when you know where the quiet secondary streets are. Especially when trails are not always connected to the destination you want to ride. When trails or bike designated routes are not available look for parallel streets and avenues that are a block or two off the main auto route to the event. Usually these streets offer low traffic shaded lanes to get you to the destination desired. For the first few outings, a six to fourteen mile round trip by bike is plenty. If the festival is further away and your family is new to biking to events consider multi-modal commuting. Using a car or public transportation to travel part of the distance and then bicycling the rest of the way). Before leaving, instruct all family members that they have to abide by the rules of the road when biking on roadways and trail. 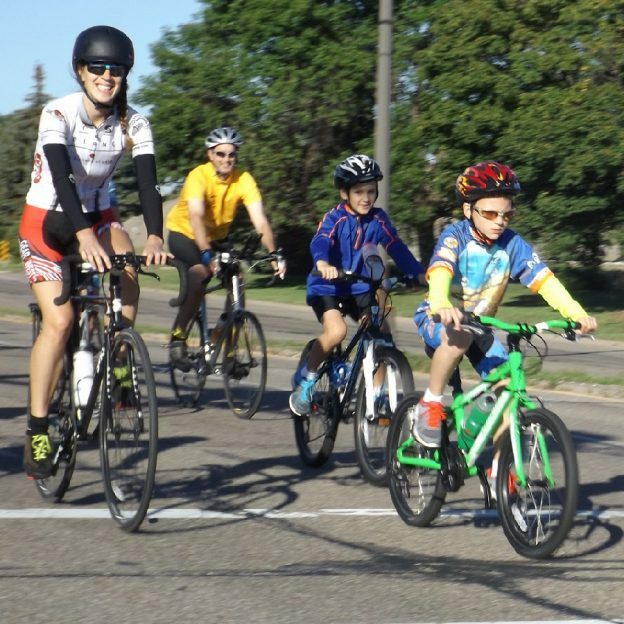 Remind them they need to, “Drive their bike”, obeying all rules as if they are driving a car.” That means riding on the right side of the road or trail signaling their turns, stopping at stop lights and giving pedestrians the right of way. When the temperature is hot while riding a bike it good to find shade and drink some water periodically. If younger children are riding, allow plenty of time. When it is hot make frequent stops every couple miles to take a drink of water, rest, stretch, etc. Before heading out, check that all the tires are properly inflated, brakes are working and chain is lubed (the ABC’s). You don’t want to worry about any mechanical issues when the family is riding. Especially on the bike trip home, when everyone is a little tired. To freshen the air in your tires you can find the recommended tire pressure on the sidewall of the tire. Here you will find the recommended PSI (Pounds per Square Inch) behind it as your ideal pressure. Is everyone carrying plenty of water or are there frequent hydration stops planned where water is available? On a hot day taking a sip or two of water every couple miles a good idea. How visible is your clothing? Check to see that everyone is wearing highly noticeable – bright clothing so your group is seen by traffic from a distance. If your return trip is later in the day have rear flashers and reflectors on each bike will help to be seen by others on the road. If you plan to return after dark a front headlight should be a part of your bike equipment. For more information on bicycle safety when riding alone or with the family check out the Walk! Bike! Fun! 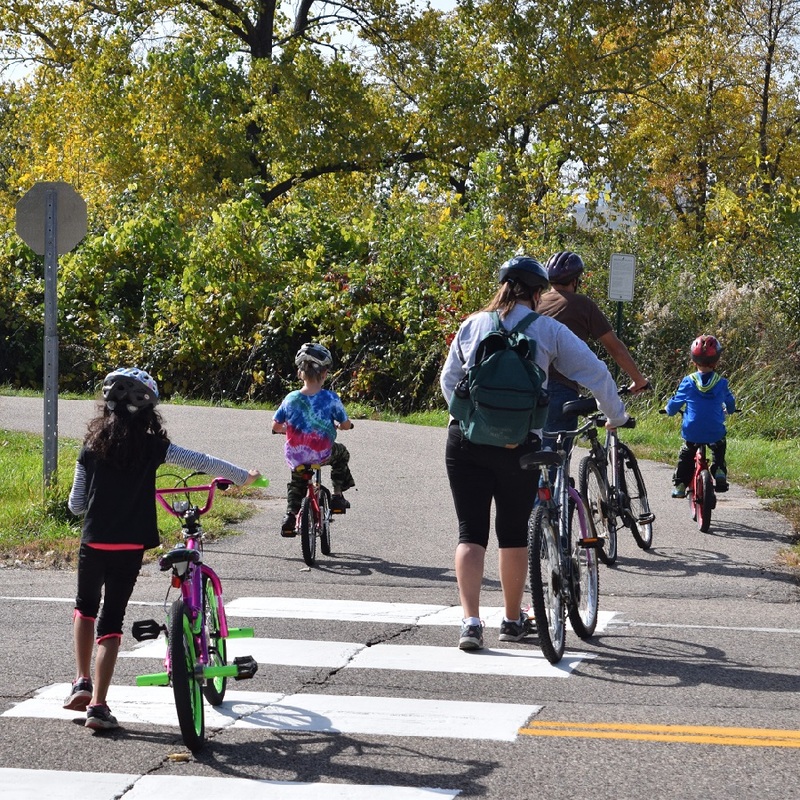 Pedestrian and Bicycle Safety curriculum. Brought to you by the Bicycle Alliance of Minnesota, it is free for you to download and use. In this bike photo the family has gathered together at a busy intersection to cross on their way to the local fair. With these helpful bike commuting tips, we hope you and your family will find the next festival or event you participate in, twice as fun. Especially when incorporating your bike into the adventure. Remember, with less parking and traffic hassles a family or group of friends has more time to bond and have fun. 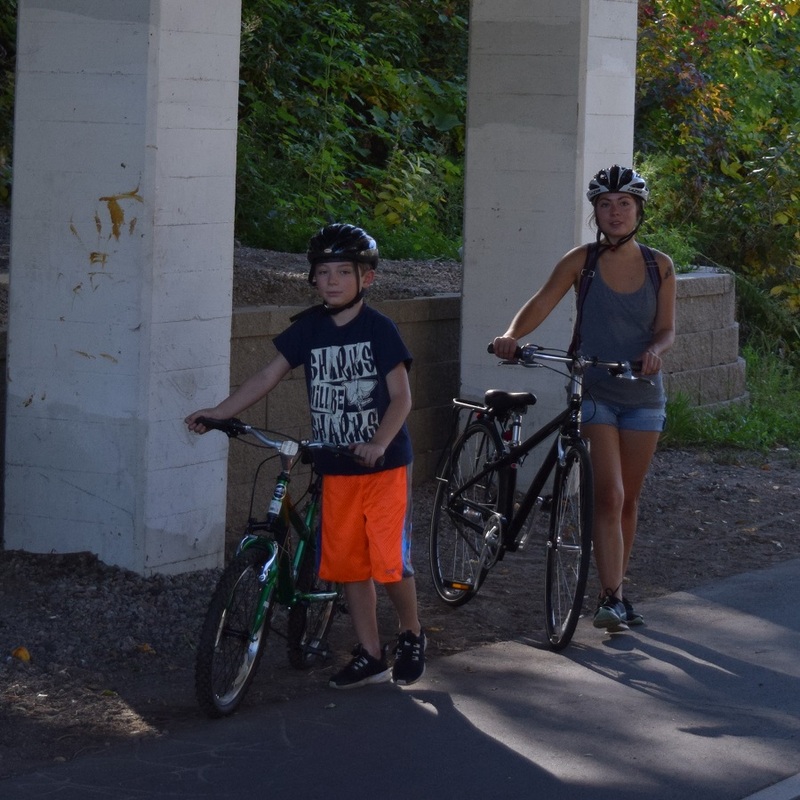 This entry was posted in News and tagged bicycle safety, Bike to events, family bike memories, family bike outing, Group bike outings, less parking hassle, less traffic hassle, multi modal bike adventure, multi modal commuting on May 27, 2018 by Russ Lowthian.